Xcaret (pronounced ish-ka-ret) is perhaps the top attraction in all of Cancun. With seemingly endless attractions, you'll need at least a full day in Xcaret to see the park. Xcaret is an Ecological and Archaeological Park located south of Cancun in the Riviera Maya that contains small Mayan Ruins as well as a wide variety of flora and fauna, including Jaguars, Dolphins, and more. THE BEST PRICES IN CANCUN ON XCARET TOURS - GUARANTEED! ADD EXCITEMENT TO YOUR TRIP - SWIM WITH DOLPHINS AT XCARET! 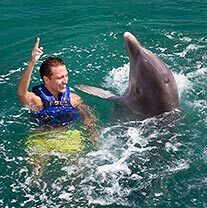 Xcaret Plus & Dolphin Ride Includes Entrance & Transportation. The others do not. They are intended to be add-ons to your Xcaret Tour. Book Dolphins first, then the Tour. We recommend taking a tour down to Xcaret - it is by far the easiest method to see the park. Make sure to reserve the Dolphin Swim well in advance - it can sell out very early - you will likely be disappointed if you wait until you get to the park. We recommend to plan your activities and your schedule ahead of time so you can maximize your time in the park - there is a lot to see and do here. We recommend the Private Tour because it takes you directly there and back, on your schedule, giving you the most time at the park, and saves you a couple hours of transportation time by not having to pick anyone else up at their hotels. Of course, it costs more for small groups, so it's a trade-off. For the public options, if you want a buffet lunch then Xcaret Plus is definitely the way to go. The buffets at Xcaret are expensive - around $30.00 per person. However, there are ala carte restaurants where you can order things like hamburgers for less money. If you prefer this type of meal, then the regular Xcaret tour may be the best value for you. You'll want to stay for the free Night show - it's quite good. Skip the Scuba Diving and do it in Cozumel instead. The crowds are smallest on Saturday and Sunday, as they are travel days for many people. Xcaret is a great place - the kids will love it too. If you have kids and you're not sure which to do - Xcaret or Xel-Ha, pick Xcaret - you won't be sorry. The vast majority of visitors to Xcaret do so on a tour. This is the best way to get there, as the tour will include hotel pickup and drop-off. The night show is always included for free. A private tour will get you a couple of extra hours at the park while a public tour can cost a little bit less, especially if you are only a couple of people. This is usually the most cost-effective way because the entry fee to Xcaret alone is $75 so if you can get picked up and dropped off at your hotel and not have to drive for only $14 extra - that's a good deal in our book. If you are an independent traveler and cringe at the idea of a tour, even a private one, you can get to Xcaret by rental car, by bus, by taxi, or by collectivo. The collectivo or bus will let you off along the highway where the "Flintstones" shuttle bus will pick you up every 10 minutes and take you to the park. A taxi from Cancun will cost you between $80 and $100 one-way. After 7:00pm, there are no more collectivos and you'll have to take a taxi so beware. A taxi from Playa Del Carmen is about $15 each way. Public buses are about $3.00 from Cancun and Playa Del Carmen.